JooseBoxx.com | Inland Empire Hip Hop: Of Grammies and ghosts of G.O.A.T.S. Of Grammies and ghosts of G.O.A.T.S. 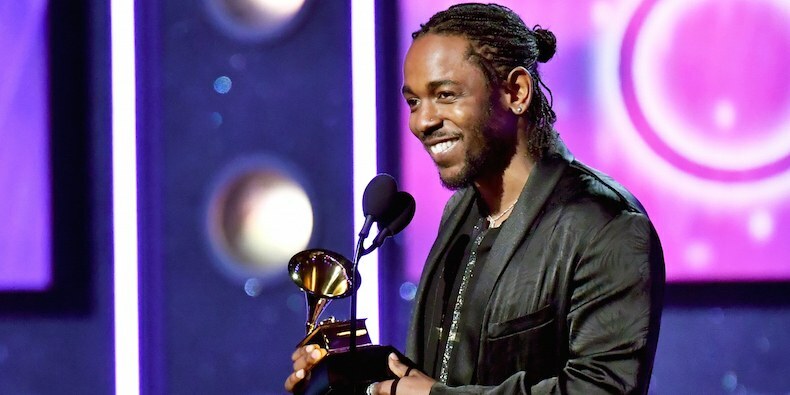 Artists like Kendrick in the post-Lady Gaga mold, which is most post-2010 artists on the pop-charts, aren’t making music so much as they are making short-films they are soundtracking. Kendrick’s movie albums are great art that are must-peep cultural documents but they’re not like a collection of vibey songs I want to have playing as I blaze or drive. I hear Drake mentioned in discussions about Kendrick since the Grammy’s aired in the last 36 hours. About that I’ll say there’s nothing to dislike about Drake just as much as there’s nothing to dislike about vanilla ice cream. It’s not gonna break any rules of good taste but it’s not gonna break any ground either. If Drake is on the “commercial impact is weighed far more heavily than artistic merit” part of the spectrum, I’d put Open Mike Eagle on the “artistic merit is weighed far more heavily than commercial impact” part of it as far as talking about how we measure the greatest rap artist of 2008-2018 but what decade we’re talking about matters. People saying Kendrick is the greatest rap artist of the decade may mean the decade that began when his major label debut came out in 2012, or the decade that begins now. All that matters. I am not so close-minded or snobby as to be un-open to the possibility that the greatest rap artist of a given decade couldn’t both be the artist with the most artistic merit and commercial and cultural impact. I just think it’s rare. In terms of hip-hop, OutKast comes to mind and even then, while the Stankonia praise was well-deserved, the post-Stankonia work really got the praise that Aquemini should have gotten. While Kendrick has that kind of potential, I don’t think he’s there yet. His work, while a much smarter modernized take on the world Dr. Dre and N.W.A introduced us to, is still too pedestrian and familiar in that way. OutKast made their version of Atlanta a place out of time and space; they made us believe in Stankonia. I’m not there yet with Kendrick but I hope to be at some point. As far as Grammy's, the fact that as a rapper you have to be as big as a Kendrick to even have the chance to have the privilege to lose in the biggest categories, the fact that artistic statements from creators as huge as Open Mike Eagle aren't even popular enough to warrant consideration in the spectacle, that the institution is still one so conservative a Spanish language song with billions of listens globally couldn't win a single award, are all indications that the opinion of this event and those who throw it isn't even one worth considering seriously. We might all be better served with a big great concert and a huge "Good Job Everyone!" sign.